Find Iowa community system maps, point-in-time reports, data and more regarding housing and homelessness in Iowa. The Institute for Community Alliances produces an annual analysis of homelessness in Iowa, and across Iowa's communities. 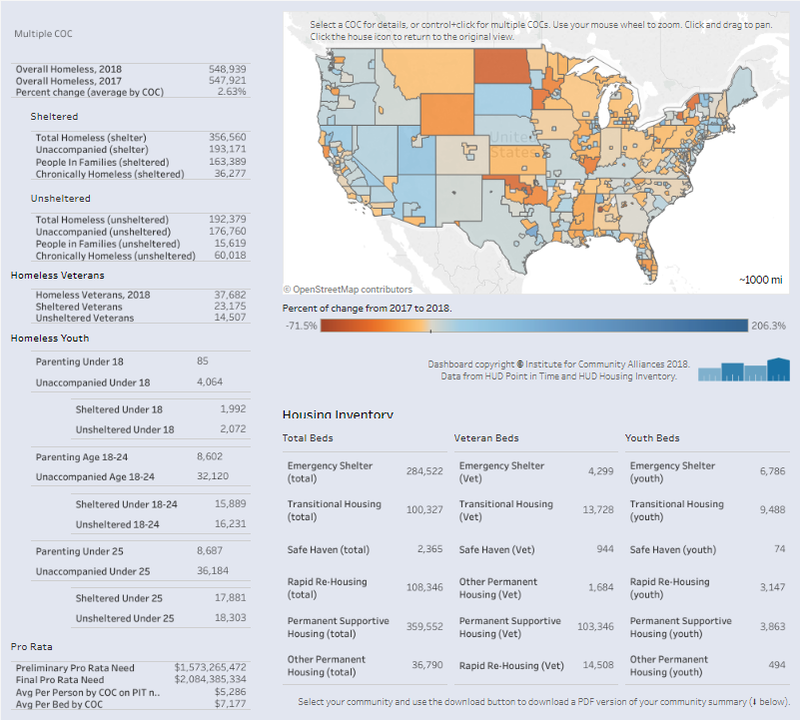 Explore the 2018 Point in Time and Housing Inventory for every continuum of care in America, including territories, on one clickable map. Each year, the Institute for Community Alliances compiles a report on the state of homelessness in Iowa, with the goal of providing an overview of trends and characteristics and informing efforts to end homelessness statewide. Annual Homeless Assessment Reports (AHAR) provide extensive information about the demographic characteristics of persons experiencing homelessness and their service use patterns in a one year period. The Day on the Hill is the annual meeting between members of the community, the Iowa Council on Homelessness (ICH), and Iowa State Senators and Representatives to discuss the state of homelessness in their districts and how they can help end homelessness in Iowa with continued support, legislation, and funding. Housing Inventory Reports provide information about the number of beds available to various subpopulations in each of the categories of HUD-funded housing: Emergency Shelter (ES), Transitional Housing (TH), Safe Havens (SH), Rapid Re-Housing (RRH), and Permanent Supportive Housing (PSH). Continuum of Care (CoC) Homeless Assistance Programs Dashboard Reports show claimed geography and geographic coverage changes for the previous two program years and also include information on each CoC’s awards by award amount, program type, and renewal type. The reports contain summary data from the Point-in-Time (PIT) count and Housing Inventory Count (HIC), which provide a quick overview of a CoC’s performance in serving homeless individuals with their CoC awards. Point in Time (PIT) reports provide a snapshot of the number and characteristics of sheltered and unsheltered persons experiencing homelessness in Iowa's Continua of Care. Special reports address topical issues of importance to Iowa CoCs and communities. A critical aspect of the McKinney-Vento Homeless Assistance Act, as amended, is a focus on viewing the local homeless response as a coordinated system of homeless assistance options as opposed to homeless assistance programs and funding sources that operate independently in a community. To facilitate this perspective the Act now requires communities to measure their performance as a coordinated system, in addition to analyzing performance by specific projects or project types. The Act has established a set of selection criteria for HUD to use in awarding CoC funding in section 427 that require CoCs to report to HUD their system-level performance. The intent of these selection criteria are to encourage CoCs, in coordination with ESG Program recipients and all other homeless assistance stakeholders in the community, to regularly measure their progress in meeting the needs of people experiencing homelessness in their community and to report this progress to HUD.